PARMA, Ohio (CNS) — The ongoing water crisis in Flint, Michigan, is a reminder for Catholics in suburban parishes of their responsibility to reach out to people in need in urban centers, said Father David A. Hannes. Father Hannes is the pastor of St. Michael Byzantine Catholic Parish in Flushing, Michigan, located about 11 miles northwest of Flint, where the tap water is still undrinkable. The parish, which is in the Byzantine Catholic Eparchy of Parma, has strong links to Flint. It was founded there in the early 20th century; its first church was built in the city center in 1917, at the corner of North Street and Addison Street. The parish moved twice since then: first to Flint’s north side in 1954, in response to a growing number of parishioners; then to its current location in 1984, following the movement of parishioners out of the city and into the suburbs. Keeping their connection with Flint, however, parishioners return to the city monthly to volunteer at the North End Soup Kitchen, about six blocks from the site of their first church, where they prepare and serve a meal. So when Gov. Rick Snyder declared a state of emergency in Flint Jan. 5, after studies had found contaminants in Flint’s drinking water, including high amounts of lead leaching into the water from the city’s dated water pipes, St. Michael’s parishioners wasted no time in responding with action and prayer. The parish community gathered the following day. During the celebration for the feast of the Theophany Jan. 6, which includes the Great Blessing of Water in the Byzantine tradition, the pastor spoke about Flint’s water crisis and prayers were directed to those afflicted. Parishioners also prayed the Akathist Hymn to Mary for the same intention before all liturgies during the parish’s “All Lives Matter” weekend Jan. 22-24. “The bricks” refer to the old streets of Flint, explained Father Hannes in an interview with Horizons, the newspaper of the Parma Eparchy. 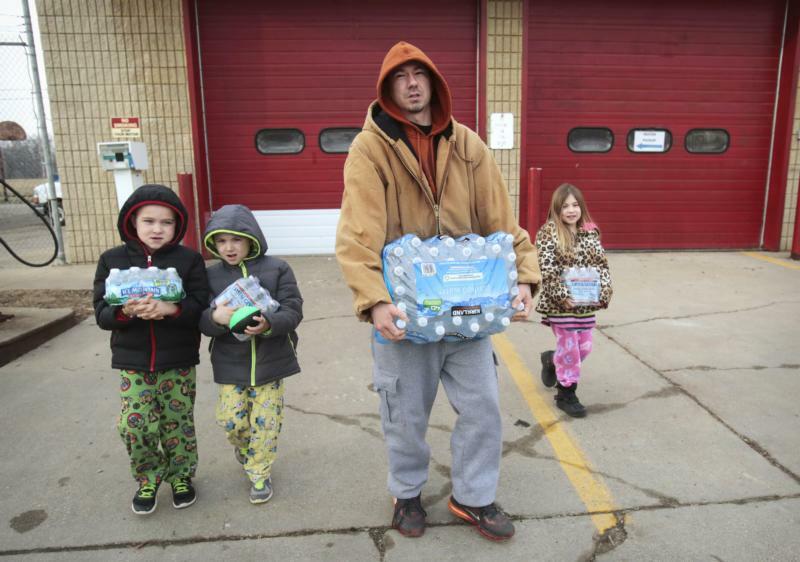 “Flint residents feel quite abandoned,” he added. And the sign is “an outward reminder perhaps, even a warning, to those who are living in the suburbs — many of whom left or perhaps, as they may say, ‘escaped Flint’ — that they have a moral responsibility to live the Gospel and not to abandon the people of Flint or anyone,” he said. St. Michael’s partnered with Catholic Charities and other churches and organizations in helping Flint with immediate needs, through monetary donations, cases or gallons of water, water filtration kits, and replacement filters. Ieraci is editor of Horizons, newspaper of the Byzantine Catholic Eparchy of Parma.